Why Invest in Vacation Homes? Time is money. The value of having an agency handle rental for you allows you to focus on the enjoyment of your second home versus the rental and maintenance aspects associated with home ownership. Filtering inquiries, booking reservations, greeting guests, servicing the guests while they are in your home, maintenance calls, trust accounting, tax submissions, and marketing all take a large amount of time. How does the return on the time it takes to do all these items compare with your regular earning potential during these hours or to the value of time spent doing things you love? Security of your investment is key. On-site personnel is essential for assuring that your home is in good order and guests have left the home as they found it. What if something does happen during a guests’ stay? Handling collections and legal issues surrounding damage or an event can be difficult especially if the issue isn’t caught in a timely manner. How will you know if your home is secure and maintained without hiring someone to check it for you? Attention to you and your guests are the focal points of a professional agency. Vacation rental management companies are in business to bring agency, homeowner and guests together in business transactions that benefit all parties. It is what they do. Agencies hire full-time employees and provide them with professional and legal training as well as stay knowledgeable about industry trends. Agencies also have systems in place to take care of owners and rental guests. Some agencies also may have an attorney on staff to assist in daily decisions regarding rental receipts and advise on issues that arise. Exposure through marketing brings awareness and results in bookings. When you list your home with a website provider you become limited to one stream of exposure. A professional agency may list your home of the very website you are considering and pay the associated fees; however, an agency invests money in many forms of advertising including web, print, direct mail and public relations. Satisfaction comes in many forms. In the short-term the savings may seem worth it; however, peace of mind is worth something. “For rent by owner” sites taut booking results, but what about your personal experiences with rental guests and the overall experiences of the guests themselves? Taking the worry out of maintaining a home you visit several times a year, the challenges of customer service and all the various components of renting a home is what a professional agency does. Before listing your home on a “for rent by owner” site, research rental agency firms and weigh your options. Vacation rental management companies with proven track records can offer a way for homeowners to enjoy their second home instead of manage it. Red River Real Estate, LLC strives to be the leader in the Vacation Rental business. 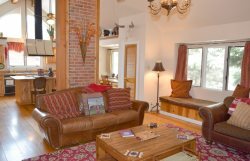 Locally owned and operated in the beautiful mountain valley of Red River, New Mexico we offer a superior vacation rental service that provides a convenient and pleasurable experience for both homeowners and guests. We combine years of real estate and rental experience with an unprecedented level of professionalism to make owning a vacation rental home in Red River an enjoyable and profitable venture. There are many important factors when making the decision to add your cabin to a rental program. We encourage you to take just a few minutes and see why you should consider Red River Real Estate, LLC as your choice for the management of your assets. Red River Real Estate, LLC has been a popular rental company in Red River since 1975. We feel as though these years of experience have assisted us in the process of managing your investment property successfully whether your home is a condo, townhome or cabin. Our one-on-one experience with our homeowners greatly exceeds expectations of the vacation rental business. We would love to put our experience to work for you and your future guests. We hold a personal as well as professional obligation to service our owners and our guests. As local residents, we are able to respond immediately to all our guests concerns and homeowners needs. We strive to be receptive to every need and promote your cabin fairly. Every guest is treated respectfully and given the needed attention because we believe that when this happens, there is a better chance the customer will return to your home. Repeat business is very important in the rental industry. In fact, it is the easiest business in the Hospitality Industry. More competition arises in this industry every day so we work constantly on our prices, quality and availability so we can reach the thousands of people that visit Red River, New Mexico annually. At Red River Real Estate, LLC we view our relationships with our homeowners as a partnership. We make it a priority to sit down with our owners and potential homeowners to discuss ways to maximize profits for their asset property, working together to produce a positive cash flow. We remain proactive in order to keep owners informed and engaged with everything involving their property. We strive to keep business transparent by giving owners access to their own portal; which allows them to view their statements, past and future bookings, income, and gives easy access to block off their property so they can enjoy their asset too. Red River Real Estate, LLC has an excellent marketing staff on hand that specializes in user friendly websites. We understand that with high competition our customers want a quick and convenient way to find the perfect rental. We do extensive and continual marketing research and training to offer our guests and homeowners current and accurate market rates to ensure our guests are getting the most value for their money and our homeowners are getting the best possible return for their investment in today's competitive vacation market. We are actively committed to offering homeowners the best marketing avenues available to find a wide variety of online shoppers. We also have trained staff members who handle third party advertising websites to help homeowners get even more visibility for their investment. We are continuously updating our website and marketing materials to capture a growing audience of Red River renters. We also work tirelessly to compete in all major search engines. Showcasing each property with detailed analysis allows us the ability to potentially increase rentals, obtain referrals and repeat business. Our team of additional professionals include maintenance and housekeeping which understand that a major key to success in the vacation rental business is exceptional service. At Red River Real Estate, LLC we have full-time maintenance and inspection personnel and a professional housekeeping staff. Our maintenance personnel participates in regular customer service needs and deals with many different types of maintenance issues in regards to the home. If there is a major maintenance issue with the property that we cannot fulfill, we will help aid the owner in finding the necessary crews as well as monitor progress to successfully and cost-effectively complete the task. We deeply care about your investment and we will give your home the care it needs to make your guests, and ours, continuously satisfied. Our full-time quality control personnel check each and every home prior to the guests arrival. If there are any items that need addressed they work diligently to resolve the issue before the guests arrive. Red River Real Estate, LLC also provides you and your home with a professional housekeeping staff. Each one of our housekeepers are personally trained to the highest level by us, insuring that they will learn your vacation home to maintain the property's first class condition and ensure our guest's complete satisfaction with their stay. We appreciate your interest in our services and would love the opportunity to meet with you to discuss maximizing your Mountain Property's potential! We look forward to a successful partnership with YOU! Please contact us at 1-800-453-3498 for more information on property management.